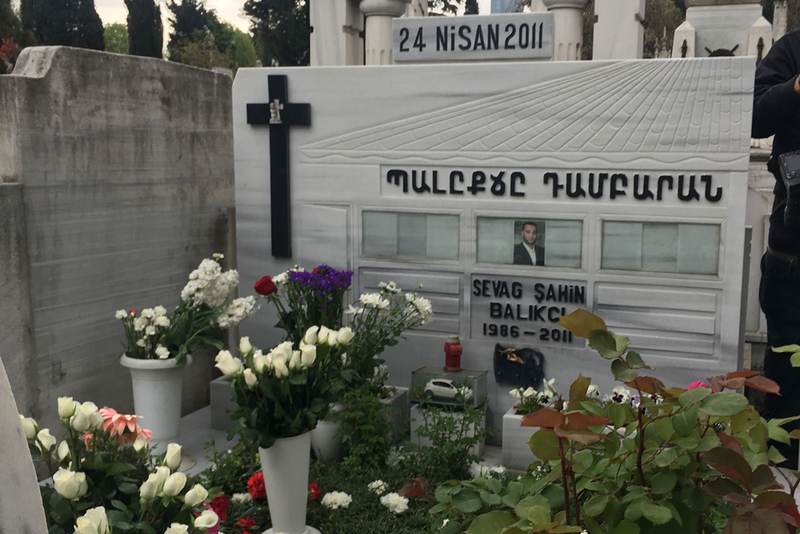 A hundred or so mourners gathered on April 24 beneath heavy clouds in an Istanbul cemetery at the grave of a 25-year-old soldier, murdered exactly six years ago, on the anniversary of the World War I massacre of Armenians. The previous week, a court awarded Balıkcı’s parents about $11,000 in compensation, finding the soldiers’ commander had failed to train and supervise them properly. A criminal case continues, but the ruling has done little to lift the Balkıcıs’ hopes for justice. Balıkcı’s death, and the official response, underscore how the century-old massacre of Armenians by Ottoman troops continues to haunt modern Turkey. Turkish officials insist that the mass killings by Ottoman troops do not amount to genocide. The dispute has throttled relations between Turkey and Armenia: the two countries do not have diplomatic relations, and their mutual border has been sealed since 1993. Ankara shut the border that year in protest over Armenia’s conduct of a war against Azerbaijan over the Nagorno-Karabakh territory. Efforts to reconcile the two countries have defied repeated attempts, most notably in 2009, when protocols brokered by the United States would have exchanged diplomatic personnel and opened a border crossing. The deal fell apart after opposition from Azerbaijan and Turkish President Recep Tayyip Erdoğan, then prime minister, who said any normalization would first require peace in Nagorno-Karabakh. Despite the diplomatic stalemate, Armenia and Turkey are quietly taking steps to boost commercial and security ties. Turkey, which has struggled with a series of foreign-policy setbacks from Syria to Egypt to Cyprus, could support an incremental improvement with its eastern neighbor, said Richard Giragosian, director of the Regional Studies Center, a Yerevan-based think tank. Opening an embassy in either capital is unlikely, but accrediting Turkey’s ambassador in Tbilisi to Armenia and elevating the credentials of Armenia’s representative to the Istanbul-based Black Sea Economic Cooperation Organization have been mooted, said Giragosian, who is active in expert-level – known as Track II – diplomatic efforts between the two countries. Airplanes carrying entrepreneurs and tourists between Yerevan and Istanbul are full after a discount Turkish carrier tripled the number of flights at the start of 2016 and eased ticketing processes in both countries. Bilateral trade jumped nearly 30 percent after Russia slapped sanctions on Turkey following its downing of a military Russian jet in late 2015, Giragosian said. Turkish agricultural and other products were routed first through Georgia, then Armenia, before being re-exported to the Russian market. Security and intelligence sharing are other potential sources of cooperation. Defense officials in recent years have conducted inspections of a handful of each other’s military installations under the Treaty on Conventional Armed Forces in Europe, Giragosian said. He also cited Armenia’s return of suspected Kurdish militants and a drug criminal to Turkey in recent years as signs of growing collaboration in law enforcement. But a diplomatic breakthrough remains distant, especially after renewed violence in Nagorno-Karabakh left at least five Azeri soldiers dead in February. During four days of clashes in April 2016, 200 people were killed, marking the worst fighting in the territory since a 1994 ceasefire. Turkey has military obligations to Azerbaijan, a country with whom it shares linguistic and ethnic ties. A sharp escalation in the conflict could pit the NATO ally against Russia, whose soldiers man the Armenian frontier with Turkey. “Armenia is at the bottom of Turkey’s list of priorities, but how many countries are there in the world where the border with a neighbor is still shut?” said Aybars Görgülü of Public Policy and Democracy Studies, a think tank in Istanbul. Although Turkey has aspirations to be a regional heavyweight and boasts a far larger military and economy than Azerbaijan, Baku appears to wield significant clout over Ankara’s policy in the Caucasus, he said. “The only chance for an agreement with Armenia is if Turkey can convince Azerbaijan, and that isn’t possible as long as Azeris and Armenians remain at war. A deal that doesn’t take Azerbaijan’s interests into account could quickly become another foreign policy failure for Turkey,” Görgülü said. With Turkey’s membership talks with the European Union hanging by a thread, and relations with the United States strained by strategic differences in Syria, Turkey’s Western allies lack diplomatic leverage that could be used to pressure Ankara to set aside its differences with Armenia. Yerevan has not made recognition of the genocide a precondition for negotiations with Turkey. But the debate has left its scars on generations on both sides, and confronting the tragedy will eventually be at the heart of meaningful reconciliation. “As long as Turkey refuses to deal with matters of conscience at home, it cannot have a real opening with Armenia,” said Garo Paylan, an opposition lawmaker who is one of three ethnic Armenians in the Turkish parliament. Despite Turkey’s official denial of genocide, Erdoğan has made conciliatory gestures towards the 60,000-strong Armenian community that still lives in Turkey and, on April 24, again expressed sadness over the mass loss of life just over a century ago. “I commemorate those Ottoman Armenians who lost their lives in the terrible conditions of World War I and give my condolences to their descendants,” Erdoğan said in a message to the Armenian Patriarchate in Istanbul. Grassroots commemorations have started up in Turkey on April 24 in recent years. The event at Balıkcı’s graveside was one of a half-dozen events around Istanbul marking the 102nd anniversary of the start of the genocide. Far from the corridors of power, Ani Balikci, who lost relatives in the 1915 genocide, said the 100-year-old wounds remain raw. “I am grateful that Sevag has not been forgotten,” she said.